The sign on the gate said Chef’s Garden. The place looked abandoned. No one was looking so she entered, and right away was drawn to a patch of blue. Fresh, frosty, mentholated blue. Oh, that color. An icy, almost iridescent blue that could thaw into green or purple with the passing of a cloud. A blue you could fly in. Or float in. Like the color of snow at twilight, a ghostly pale blue that defied reality. And petals with ridged edges, like the gnawed ears of tomcats. Leaves that opened to the sun, yet wrapped the flower’s core tightly in shadow. Blue roses, she thought. How beautiful. For an hour she photographed them up and down, zooming in and out. She knew her roses. Roses were a symbol of love: Pink roses showed appreciation and gratitude. Yellow roses said Remember Me. White was the bridal rose, and orange meant excitement and desire. Peach-colored roses extended sympathy. The darkest crimson was for sorrow and grief. Over the course of her life she’d given and gotten them all. But a blue rose. That was special. A rarity in nature, a blue rose symbolized the impossible, the unattainable. An unrealizable dream, a never-to-be-fulfilled wish. Or it could mean starting all over again but on a different path, and triumphing against all odds. A blue rose could represent immortality. Or the death of hope. Later, when she viewed all the photos she’d taken in the garden, it was the ones of the blue roses she kept coming back to. The camera had almost perfectly captured the moonshadow-blue color. Her eyes danced over each image with something like joy. 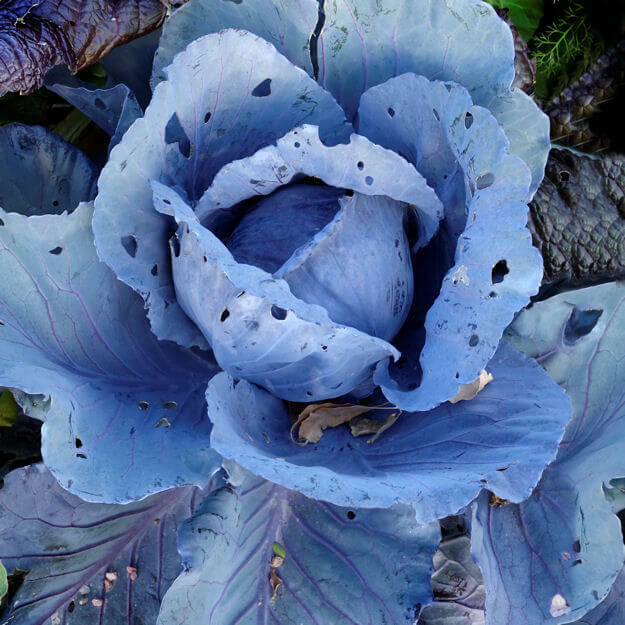 People told her, that’s just a rotting cabbage riddled with wormholes. But she knew better. This entry was posted in 2017 and tagged beauty is in the eye of the beholder, blue roses, garden photography, impossible dream, In the Eye of the Beholder, on valentines day, rose color meanings, rose colored glasses, shades of blue on 2017/02/13 by Robin Botie. Hi Mike. Welcome to my online home. I was hoping no one would be reminded of “The Glass Menagerie.” I loved that play although I can barely remember it now. But I guess that’s what metaphors do, they trigger memories and other images. Anyway, I’m thrilled by your mention of Tennessee Williams and Shakespeare right here on my blog. Such great company to call on as guests in my home here. Cheers! Yes, she knew better and you’ve constructed a beautiful story that draws me in to the big issues you’ve faced and we all face sometime or later. Your manuscript is too powerful and unique to sit in a drawer or on a shelf. Thanks, Robin. Oh, such kind warm words, Elaine. When in doubt, I write in the third person point of view. But I’m going to take your words and keep at it. Thank you so much. Ooooh! Mom! Thanks. Wish you could have met that cabbage in person. I’m sure it would have been an awesome inspiration to you too. Wouldn’t it be great if we could find amazing engaging things every single day? Other than food, I mean. Beautiful, Robin–the photo and the words! I’m glad to hear you’re going back to your manuscript. I loved what I heard you read from it. But I also understand the hesitation and confusion–a state I’m very familiar with right now, in fact. We are partners in the state of hesitation and confusion, Lynne. Sorry they’re coloring your life now too. I’m trying to find ways to be grateful for this. I mean, it means we are alive, sensitive, thinking people. It means our lives are not simple. We don’t take things for granted, maybe. We’re going to survive this because it is temporary. What on earth do we need to do, or hear, or have in order to feel confident, I wonder? Wishing you whatever it takes. May the force be with you. I love it! What a haunting shade of blue! Amazing how you can capture its beauty and write such meaningful words about it. Brava! Thanks, Annette. I kinda fell in love with that blue. It was like allowing myself to write a loveletter to the cabbage. Fun. Must try it with something deliciously red sometime.